Published on Monday, September 25, 2017. This article appears in the August/September 2017 issue of American Craft Magazine. 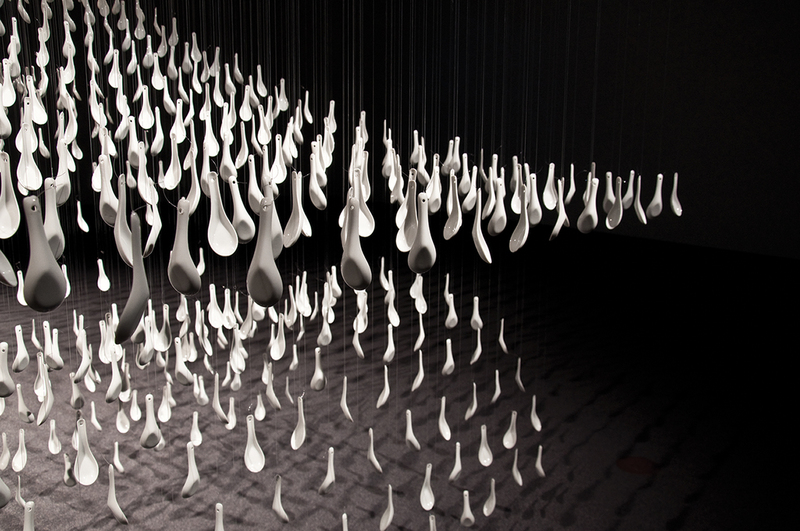 More than 1,000 ceramic spoons form an ethereal walkway in Xiaojing Yan’s Bridge (2009). As the “Star Spangled Banner” played at the 1968 Olympic Games, medalists Tommie Smith and John Carlos bowed their heads and raised their fists in support of universal human rights. Decades later, the seminal gesture remains as timely as it was in the late ’60s. 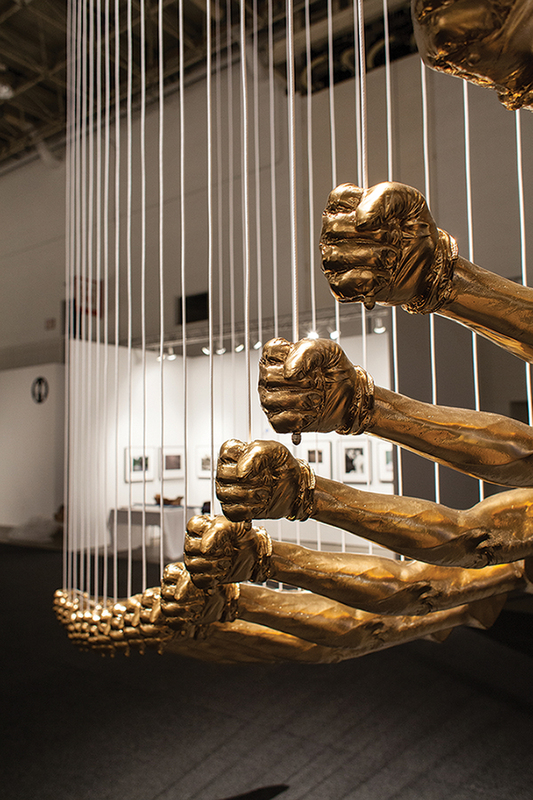 Made of fiberglass castings of Smith’s arm and fist, Los Angeles artist Glenn Kaino’s Bridge, first installed in 2013, threads the act of protest through time and space. Ceramist Tom Lane uses urns and other vessels to contemplate how modern society represents loss. His vases memorializing the 2007 collapse of Minneapolis’ Interstate 35W Bridge link the awe-inspiring aesthetic of an overpass – particularly its captivating positive and negative space – with its potential fragility. Play rock-paper-scissors with British artist Steve Messam, and you’ll quickly learn why paper trumps rock. 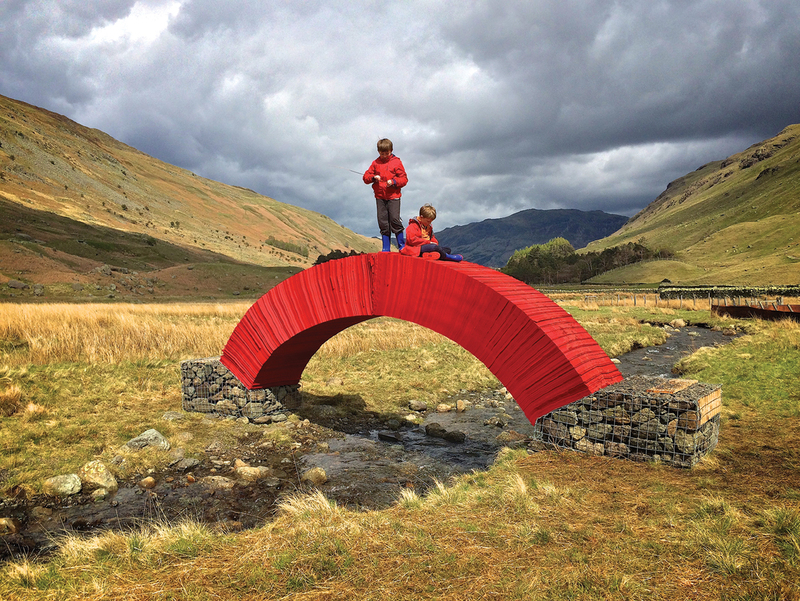 Compression alone sustained his crimson PaperBridge (2015) – built strong enough to endure wind and rain and bear the weight of adventurous hikers for the 10 days it stood in England’s storied Lake District. A second version of the project installed in China later that year dared to take things up a notch: The work supported an SUV. 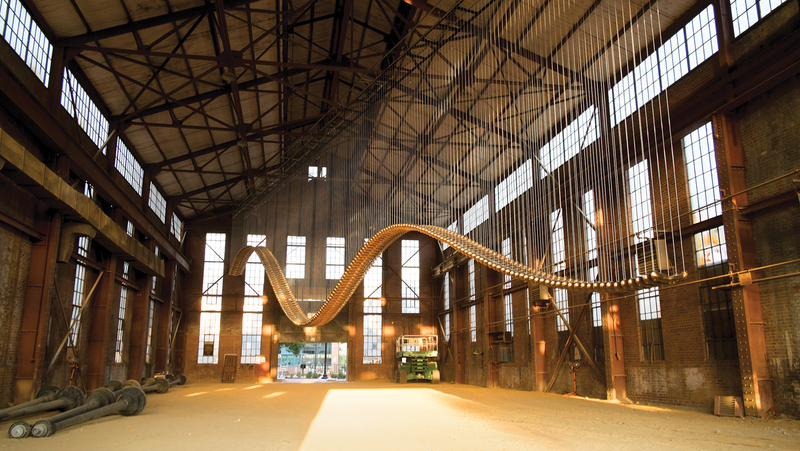 More than 1,000 ceramic spoons form an ethereal walkway in Xiaojing Yan’s Bridge (2009). A Chinese émigré living in Toronto, Yan frequently explores the complexity of a multicultural existence. “I filter Chinese thoughts through English words, English words through Chinese culture, and my images through the concepts of my art – all the while, my core sense of self remains suspended above and between these two worlds,” she says. 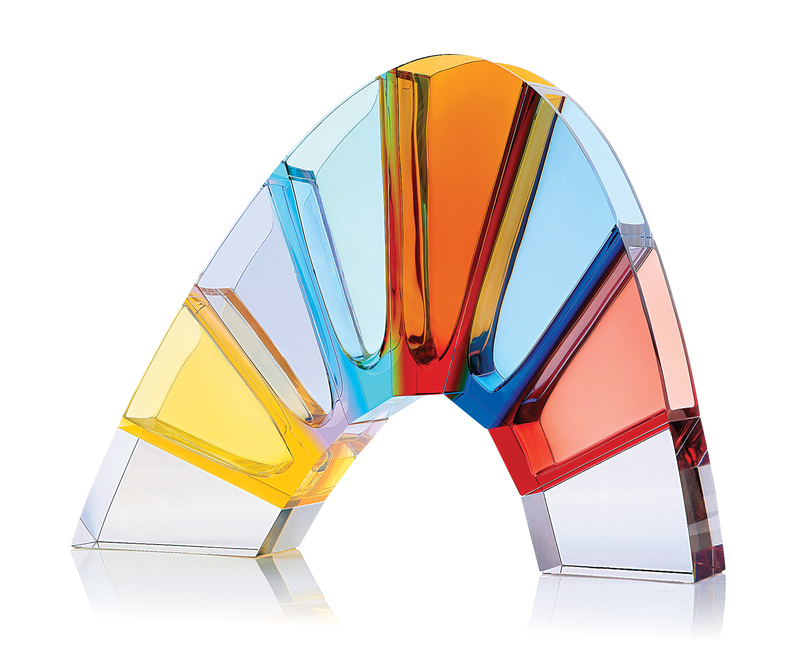 Lukáš Jaburek, art director of Czech glassworks company Moser, designed this piece; depending on how you want to look at it, the hand-cut glass arch forms a bridge, a rainbow, or a vase for inventive florists. 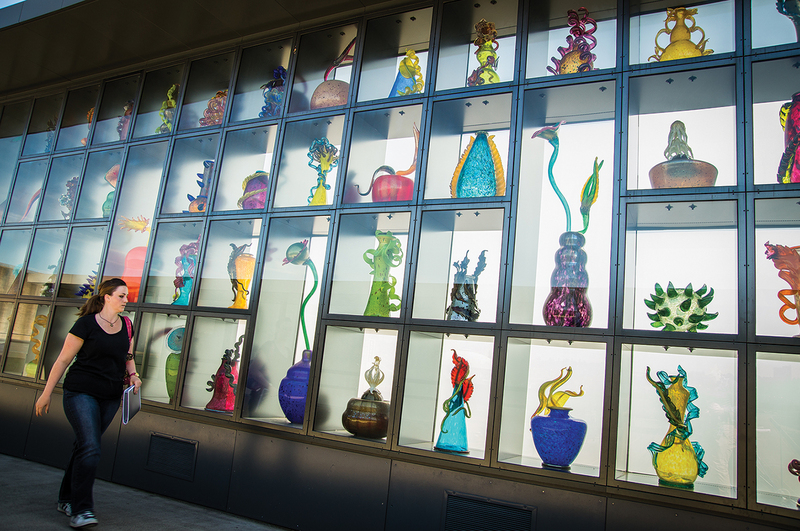 Architect Arthur Andersson designed the Chihuly Bridge of Glass to connect the Museum of Glass with downtown Tacoma, Washington. 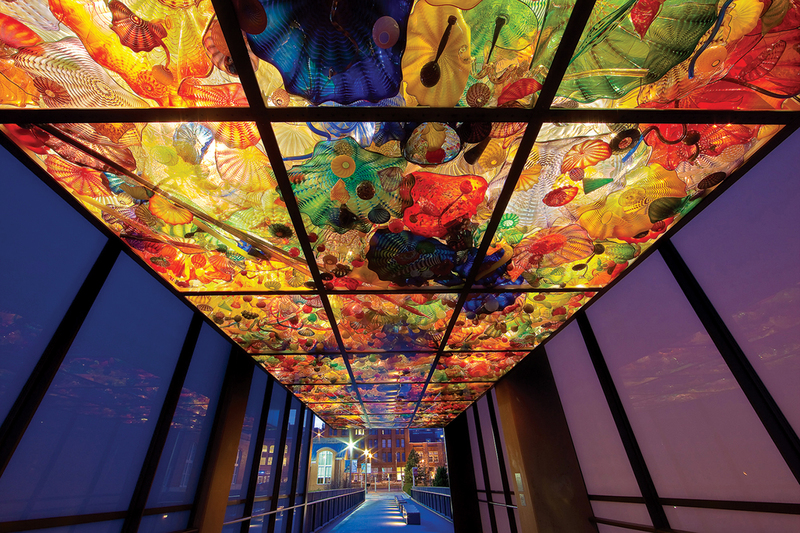 Made in collaboration with its namesake artist (a Tacoma native), the bridge features three distinct installations: the Venetian Wall, a showcase of blown objects drawn from Western and Asian traditions; Crystal Towers, blue polyurethane spires lit from below come dusk; and Seaform Pavilion, a ceiling composed of more than 2,400 lustrous works that create the illusion of a kaleidoscopic underwater excursion. 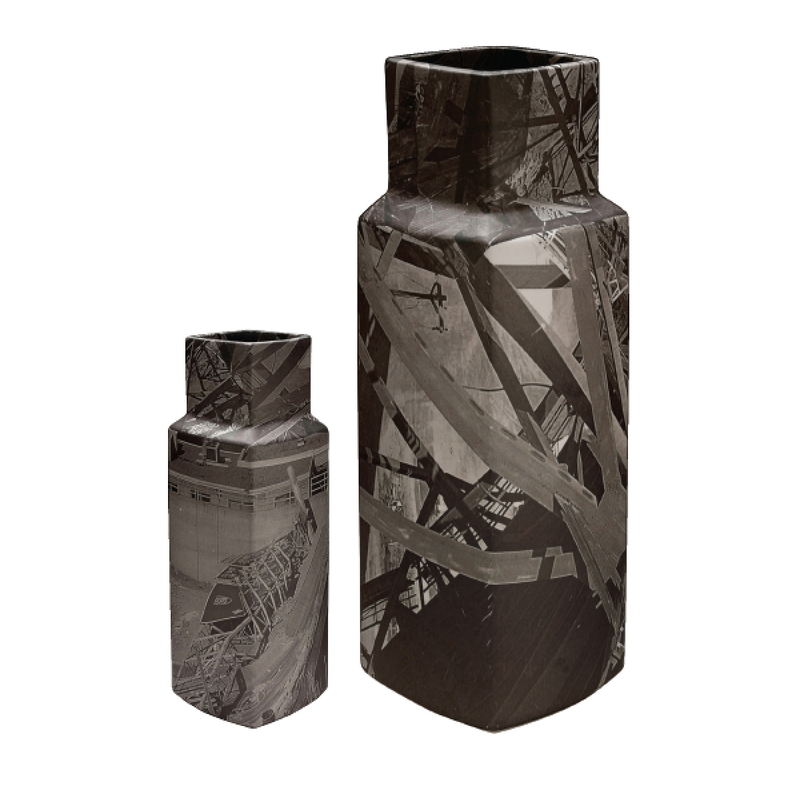 Tom Lane's vases memorializing the 2007 collapse of Minneapolis’ Interstate 35W Bridge.